Read my recent hit ‘provocative’ long read for Wired in full bellow or the original here. While this story was widely covered in the UK/US media I believe I was the only journalist to go beyond it and ask the big questions behind it. I also secured an exclusive interview with Frank Meehan, one of the founders of Siri and DeepMind. In 1925, creationists at the Scopes Trial in Tennessee argued against the theory of evolution and in favour of biblical truth. Now, 90 years later, a group of similarly fundamentalist Christians from nearby North Carolina has spent $16,000 (£9,500) on a humanoid Nao robotto explore what is arguably the next stage of evolution on Earth, the coming of the robots…. 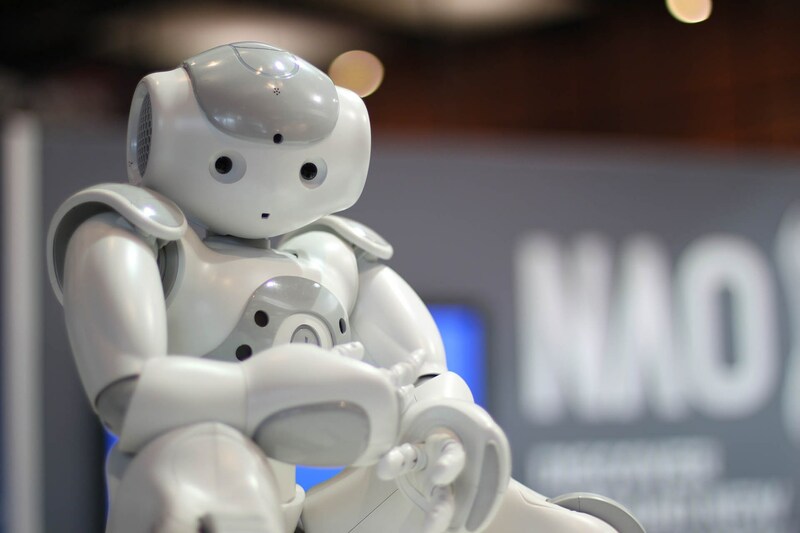 The Nao is an autonomous programmable humanoid robot developed by Aldebaran Robotics based in Paris, France, and more than 200 of them are already in use at universities and colleges around the world. According to Dr Kevin Staley at the Southern Evangelical Seminary in Matthews, North Carolina, the aim of the project is to “examine the potential impact such a technology holds for human society” as well as to “start a conversation” with other faith-based communities concerning the “development and uses” of robots. “What better way of doing this than having a robot and taking it to groups of people to interact with it while I observe?” he tells Wired.co.uk. Staley took the Nao along to a local youth group. When the robot fell over and tried to right itself as programmed, “most of the young people — and not just the girls in the group — showed a great deal of empathy for it and wanted to help him back up”. In his view, this demonstrates that there are limits to how robots should be used, and it comes with a whiff of fire and brimstone. The Bible teaches us that “failure to love is sin”, he says, so if robots let us “totally withdraw from caring for those so in need” like children and the elderly, then “it is clear we have sinned against them as we have failed to love them”. Going further, he believes it would even be “idolatry” if “we grant authority to something like a super AI [artificial intelligence]” as we should “only surrender to God”. The Southern Evangelical Seminary was founded in 1992 in order to spread the Christian message and to teach the defence of the traditional Christian faith, including the belief that the world was created in six days and the literal truth of the story of Adam and Eve. This is called Christian Apologetics. From its founding the Seminary has been committed to seriously engaging with the issues facing contemporary culture, says Staley. Thus, after a local businessman was “blessed with extra income” that he wanted to give to an “out-of-the-box project”, the Seminary bought the Nao robot. The purchase is designed to allow these theists to consider how Christians should respond to humanoid robots, and other technological advances such as artificial intelligence. Up to now, most evangelical Christians have been more comfortable talking about issues such as abortion and stem cell research than the impact of robotics and machine learning. Staley says that technology generally “plays well into biblical narrative” since it recognises that “most of us have to labour, sweat and suffer” during our lives, and that technological advancements have relieved some of this hardship. “After all, Jesus was about healing and restoring,” he explains. But more important than relieving hardship is the biblical narrative around the central role that humanity plays in creation. “God even took on human form,” Staley says. “While you aren’t going to find many references to robots in the Bible, even any that can be massaged in any way, one thing you can draw is the affirmation of the importance of human-to-human relationships.” The subtext is that time spent talking to robots instead of other humans is a bad thing and can be dehumanising. Staley argues that young children and the elderly can find true fulfilment only in human relationships, despite the way we anthropomorphise robots. This is not so different, he believes, from the secular Danish Council of Ethics report into the boundaries between humans and social robots in 2010. The Council was concerned that robots might be used as replacements for human contact, particularly in the context of care for the elderly. It also feared that extensive use of social robots might stunt human emotional life. These concerns demonstrate a “clear resemblance” to the “Christian response”, he says. How then should we regard the people who want to build this potentially blasphemous technology? “Christians, as well as those outside that faith, should ask the people and companies working on such a project to provide clear and well-reasoned arguments on the purpose and place of such artefacts in our lives.” This leads to the possibility that some Christians and other groups might decide to boycott, protest and even fire-bomb the offices of those companies developing AIs — the Googles, Apples and IBMs of this world — in the same way that some already target abortion clinics. For Professor Brian Brock, Reader in Moral and Practical Theology at the University of Aberdeen, it is “not really clear what they [the members of the Seminary] are after”, and he speculates that it might simply be an attempt to attract publicity as the first seminary to buy a robot. Brock is author of the bookChristian Ethics in a Technological Age — one of the few Christian books to address this issue. He does, however, share with Staley concerns over the development and use of new technology as, in his opinion, it is usually about “pride and sloth”, both of which are “sinful”. “Most tend to sloth,” since it is a lot easier to get a machine to look after children and old people than for their relatives to do it, he argues. However, these vulnerable people are not “dehumanised because of the robot but because of the human’s decision to leave them alone with a machine”. Other technologies, he thinks, hint at a “hubristic side” to innovation. “In the beginning God created the world and it is almost like we are trying to finish it. It is technology as idolatry, almost offering us the idea of resurrection in some of the dreams of the weightless existence of digital immortality they sell us, but they are bound to disappoint,” he says. Brock worries that the Seminary is in danger of falling into the same trap of “pride” and points out Staley’s background in the technology industry. Brock goes further than Staley in his criticism of the technology industry (and the press) and accuses it of having a “public face and a different private face”. “Innovators have no moral drive,” he believes. “There is no serious desire as far as I can tell to make us better humans among that class of people. It is all about profit and control behind all the stories about making history that we see in the press.” What worries him about the so-called robots revolution is that it is “being driven by publicity”. What are the hidden agendas behind the the advertising campaigns? Dr Stuart Armstrong, James Martin Research Fellow at Oxford University’s Future of Humanity Institute, believes that the kind of worries that Christians like Staley and Brock hold, in fact, massively underestimate the hugely transformative aspect of these technologies. Armstrong and his colleague Professor Nick Bostrum faced the wrath of Christian fundamentalists in the States last year when the news broke that they were paying to have their bodies cryogenically frozen when they died, as this is seen as advocating a transhumanist agenda. Transhumanism sees technology as a solution to humanity’s problems rather than God. “If you can have a personal robot that is capable of bringing up children and looking after the elderly then society will be so transformed that robots will be the last of your worries,” he says. However, Armstrong does feel that it is too easy to discount human beings’ social urge to communicate and to compete with others — an urge that explains why gamers prefer competing with others online using platforms such as Xbox Live to playing against a computer. He also feels that the Christian fear of humans being displaced by robots is a “kind of feudal metaphor” where different levels of intelligence have to be one above the other. “An AI lording it above humanity but not extinguishing humanity is a very human thought. If we don’t get the scenario whereby AIs wipe humanity off the planet, then they are likely to be a very alien mind” that share the planet with us perhaps in the same way we share it with dolphins, whales or even ants. Those worrying that Christianity itself might be displaced need only console themselves with the knowledge that “organised religion has endured a phenomenal number of changes and has reinvented itself”. However, while industry leader Frank Meehan thinks the technology will be of great benefit to humankind, he does, unlike Armstrong, share some sympathy with the concerns of Christians like Staley and Brock about its impact. Meehan is one of the co-founders of SparkLabs Global Ventures with a long involvement in AI businesses, including Siri and DeepMind before they were acquired by Apple and Google respectively. “I can’t really comment about God and I do hope robots will help out humanity as they develop,” he says, but he worries that “parents will feel that robots can be used as company for their children”. The need to retrain those people in manual occupations who will lose their jobs because of robots also “needs to be addressed”. Beyond that, there is now a huge amount of activity in AI. Meehan suspects that Google will be the company to take AI to the next level. “Google’s mission is fantastic and I would rather have them than somebody else, but whoever programs the intelligence of the first true AI, whoever gives it its first set of instructions like Asimov is likely to be making the rules for all AIs. Despite these reservations, Meehan believes that what “we are creating through our investments is of immense benefit to humanity” and he plans to invest in the sector “for a long time to come”. Previous How to build a start-up in a war zone?